Saint Peter’s celebrated its 175th anniversary in November 2018. 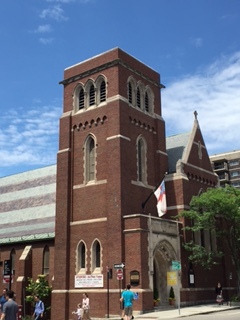 For an overview of our church’s long history of service in Cambridge, see this church history prepared for the commemorative service. Our Church Tourbook (PDF) provides a virtual walkthrough of our beautiful church, including color images of our stained glass windows and explanations of their meaning. 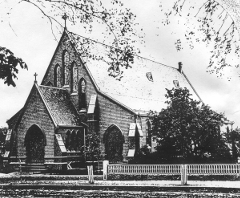 Saint Peter’s in the 1800s. We had an entire side yard! Now we only have a street tree!